"A WET, RAINY WEEK HERE IN THE NORTHERN FOREST!" The wet weather leads to inside activities and thus baking! If you live in an isolated area & love good food, then you had better learn to cook! Fortunately, I have and spent part of the week making pasta sauce, Banana Bread, Pizza and Bannock Bread ( a Native Cree Style Bread that can be made over a wood fire & is meant for a meal while travelling in the bush). If you are a calorie counter, then all of the above will give you plenty of calories to count! As you can see, inside activities are not the best for my weight. But, it makes for a strong Dog Team! With the rain, cooler temperatures have arrived and with these temperatures, the dogs are getting more active & looking foreword to the upcoming season. The temperatures in the early morning have been cool enough to run the dogs. I know that some of the Distance Mushers have started their training program getting the teams out at 5am when the temperatures are cool enough. I am looking foreword to staring my Conditioning/Training Program around the middle of September as I don't need to have as many training miles on the Sprint Dogs as the Distance Mushers need on their dogs. 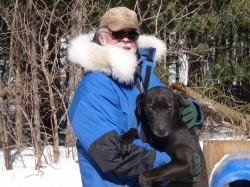 Most Distance Musher try to have at least 1000 miles of running on their dogs by the end of December. Most of the preparations for this upcoming season have been completed and only a few items are still outstanding. I hope to have everything resolved soon. I am very pleased to see that, in less than a month, more than 400 people have downloaded my book and have given me very positive reviews. you wrote : If you are a calorie counter, then all of the above will give you plenty of calories to count...haha! not the best for me!!! !